When Wetzel's Pretzels in Color Me Mine store opened in Huntington Beach in 2004, downtown Huntington Beach gained an affordable restaurant to help make up for the loss of Burger King next to Jack's Surf Shop. Wetzel's Pretzels are baked fresh and taste like home baked bread. 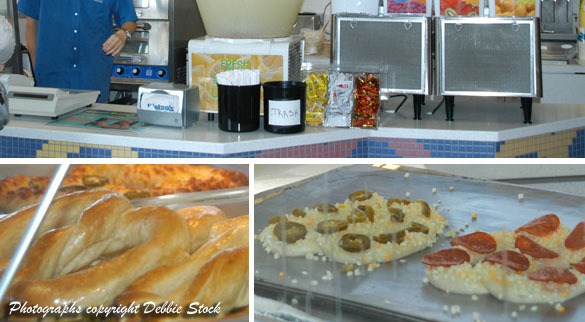 The options include pretzel-wrapped hot dogs (very tasty) in original or cheese and Wetzel bits. Pretzels options are plain, non-fat, Sinful Cinnamon, Glazed Cin -A-Yum, Almond Crunch or Sour Cream & Onion. Cheese pretzels include choices of Grateful Garlic, Jalapeno Cheese Melt, Cheese Meltdown and Pepperoni Twist. The topping-covered items taste like a blend of pizza and bread. These food items melt in your mouth. You can get your pretzel dipped in butter and sprinkled with salt or plain. The shop also serves lemonade and fruit granita (smooth, blended ice) drinks in cherry, blue raspberry, kiwi strawberry. Mug Rootbeer, Diet Pepsi and Sierra Mist are fountain drinks available, as well as bottled water. Pretzel prices begin around $2.29 and combinations with pretzel and drink cost around $5. Filling pretzel wrapped hot dogs cost $2.99 to under $5. (prices are not guaranteed and are subject to change). See downtown Huntington Beach for current list of restaurants. Perfect for adult and kids' parties, the Color Me Mine store can put together price packages to include Wetzel Pretzel meals and ceramic painting parties.